Of course, Darlings Department wouldn't waste £1,000,000 of the taxpayers money to assist it in bludgeoning and blundering its way through a minefield of its own creation, would it? You'd think that before weighing out all that dosh on the big Pathfinderisation of Streatham, someone would check that it wasn't due to be demolished for the Vogons to build a hyperspace bypass, wouldn't you? But I exaggerate. The following article & artists impressions are culled from local bi-weekly paper the South London Press dated 14/12/01. For those with a keen eye for detail I have marked the position now occupied by Streatham Jobcentre Plus office. Take my word for it that the roof/building shown on the plan view looks nothing like the one currently in existence. In fact, no mention at all is made of having a dole office in the prestigious new project, even a grand one such as a £1,000,000 Jobcentre Plus office. A MASTER plan to regenerate a rundown corner of Streatham - based on the views of residents - was unveiled at the Greater London Assembly. 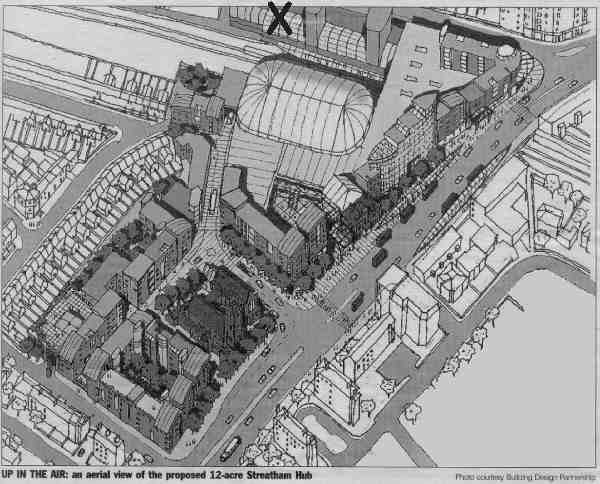 The 'Streatham Hub' plan would transform 12 acres of land around Streatham Train Station. Streatham Ice Rink would be knocked down and rebuilt as a 2,000-seat regional rink along with a new sports centre incorporating a pool, fitness centre and sports hall. 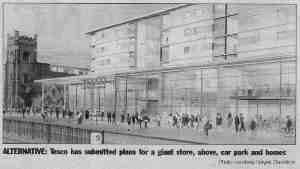 An improved supermarket would be built on the Safeway site and new shops would be created along a stretch of Streatham High Road. Streatham would also get 300 new homes and a 100-bedroom hotel. A public square with a new community centre would be built around the United Reform Church. The train station would get underground parking for 500 cars, along with new lifts and escalators. Buses would get a new turnaround stand. Better transport links are crucial to the plan, which is aimed at capitalising on the proposed arrival of the East London Line extension in Streatham. A key to 'Streatham Hub' has been the input from residents who were first shown three options for the area in May. The majority of the locals asked said they wanted a transport hub, a mix of leisure facilities and DID NOT want to lose the ice rink. Chairman of the Streatham Partnership Board Jeffry Wilcox said: "Local people have worked with Lambeth council to choose what they want to see in their own community and not have other people's plans imposed on them. "The people who live and work here have a stake in what their community should look like." An alternative plan for the area has been submitted by supermarket giant Tesco, which wants to build a 6,042sq ft store, car park and about 160 new homes. A company spokesman said the proposal "would not threaten the viability of an ice rink in the future". But in June a consultation by Lambeth council found 81 per cent of the 419 people asked did not think a new supermarket was needed in Streatham. Mr Wilcox said: "To us, using a prime site for yet another commercial outlet sounds barmy"
A Tesco spokesman said when the company carried out its own public exhibition of its plans in July about 80 per cent of people were in favour of them. GLA member for Lambeth and Southwark Val Shawcross said the 'Streatham Hub' idea, which was unveiled last week, would create a "new focus for Streatham". Streatham MP Keith Hill, the Government's Deputy Chief Whip, said he hoped leisure would feature prominently in the plans. He added: "My vision is it will become a major ice and water sports area for south London." · Have your say on the latest 'Streatham Hub' plan which will be exhibited in Streatham Town Centre Manager's office, in Streatham High Road, from tomorrow until January 12.